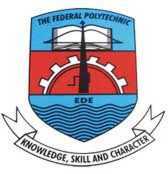 The Federal Polytechnic Ede (ND) 2018/2019 Merit Admission List has been released. And all the candidates who participated in the Post UTME Screening exercise can now check their admission status. Latest report reaching us here at Nigeriaschool.com.ng has it that the Federal Polytechnic Ede, (Edepoly) 2018/2019 Merit/1st Batch Admission List for National Diploma (ND) Candidates has just been released and uploaded on the college’s official website. To access the list of candidates who are offered provisional admission into Federal Poly. Ede for the 2017/18 academic session, go to the school admission portal by CLICKING HERE. 1. On the page that loads up, enter your JAMB Registration Number in the space provided. 2. Click on the “Check Status” to check your admission status. Those whose names appeared on the admission list are expected to login to JAMB CAP portal to either ACCEPT or REJECT the admission offer. What to do if you’re Admitted? Successfully admitted candidates should proceed to print out their admission status slip. You will however need to make a payment of N600 (six hundred naira) via the REMITA platform. Also, admitted candidates are urged to proceed with the payment of their acceptance fees and others. (NigeriaSchool will inform you when the payment commence). Both of them are out. when will they release 2nd batch for ND? We will let you know when they do. The admission list is out already. Please follow the steps in the post to check your admission status. I was offered admission at hnd level..but I can’t pay for acceptance fee yet. Please lemme know when the site is ready so I can pay asap and the deadline for acceptance & school fees. Pls when is the deadline for the Payment of the School fees? WE will inform you when the 2nd list is released. We will definitely inform you all. Pls i got 166 in jamb and pass in Eng can i still get admin here?? No. The admission list is not out yet. pls can’t we see the ND admission list serially. by using our Application No/ userID is that the only way to check the admission status ? Z it true that admission will be given to those who choose ede as first choice only n the rest pple will be packed to daily pt!!!!!! When will the second batch be out? We don’t know when. But we will inform you when it is out. We will inform you when the second batch is out. Pls av not see anything yet….i heard people saying that they are yet to release SLT course…. Pls i need a reply to it soon. is 2nd batch admition list out? When is Ede is going tom release DPT admission list please. Some people saw admission in the morning but, to be surprise in the evening to pay acceptance fees not admitted again. Why are they doing like that? pls i made a mistake while writing my jamb score it wrote Zero,i scored 156 has my jamb score,wat can i do,have not written the post utme exam,pls help me. You will have to contact the school admin, to see if it can be corrected. We don’t know when yet. But we will inform you and update the article when the list is out. We will have to wait for the list to be released. We will update the article when it is out. We will let you know when the 2nd batch is out. Will there still be another list after the second batch? when will the admission list for ND dpp be out? We don’t know when yet… but we will inform you and others when it is out.